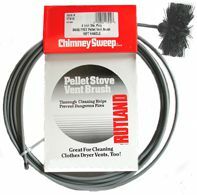 Pellet Stove Brush with Rod, available in different size brushes and rod lengths. Poly brushes flexible handle used to clean pellet stoves and dryer vents. It is designed to navigate corners without getting caught in elbows and offsets.